Two of the most interesting 2009 whites released this year from the Okanagan crossed my desk at the same time. Here is a two-for-one review. Black Hills Viognier 2009 ($30) is the first Viognier from the winery that also makes Nota Bene and Alibi, among other wines. Winemaker Graham Pierce made 440 cases, with grapes grown for the winery at vineyards Osoyoos, the Golden Mile and Naramata Bench. There is one word for this wine: exuberant! It begins with a glorious, room-filling aroma of tropical fruits. Think of guava, lychee, peaches and nectarines. The wine delivers all these flavours to the palate, along with ripe pineapple and citrus. The structure shows the classic backbone of minerals and tannin that give well-made Viognier crisp definition on the finish. The 14.2% alcohol adds a touch of warm but not too much. This is a memorable wine. 92. Foxtrot Chardonnay 2009 ($45) is the second vintage of Chardonnay from this Naramata Bench production that already has an iconic reputation with its Pinot Noir. Winemaker Gustav Allander made 340 cases. His fruit came from two vineyards: six-year-old vines (three clones) at the Coolshanagh Vineyard north of Naramata; and 36-year-old organic vines at the Pisicoli Vineyard at Westbank. Both vineyards have rocky, gravelly soils. There are two words for this wine: elegance and power! It begins with citrus aromas and a hint of spice. The winery suggests hazelnut toast and I won’t argue with that. I expect that reflects the fine French oak – Tronçais and Alliers, 75% new - in the wine was fermented. The oak flavours add subtle complexity to the buttery citrus flavours and minerality of the wine. There is a lovely taste of cloves on the lingering finish. As delicious as this wine is already, it really should be laid down for a couple of years, as one would with a good Burgundy. It will develop even more richness and complexity. 92. JoieFarm, Michael Dinn and Heidi Noble’s winery on Naramata Road, released just over 800 cases when it opened in 2005. 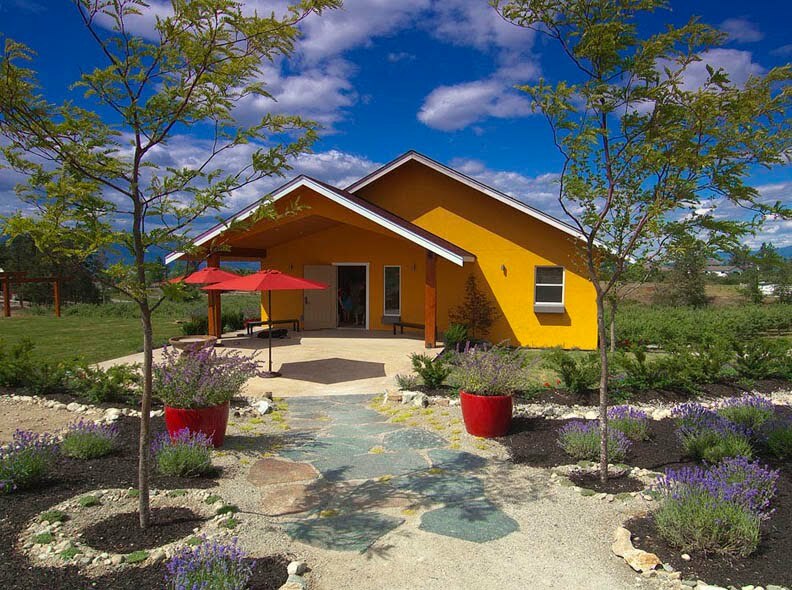 The winery gained a cult following almost overnight. Today, it produces about 10,000 cases a year. Its two reserve wines now constitute more than the entire winery volume in the original year. 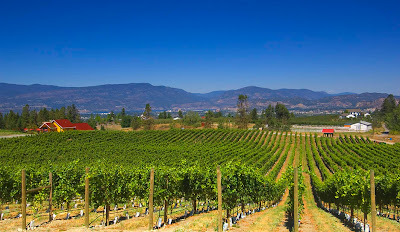 By any measure, this winery was one of the most successful launches of any British Columbia winery in the last decade. That was achieved with novelty -- aromatic Germanic whites at a time when most other new entrants got into the market with big reds and big whites – and quality. A few years ago, JoieFarm launched its reserve program, covering off the demand for a big red and a big white. The winery is just releasing its two reserve wines from 2008. The big white is the 2008 Reserve Chardonnay ($29.90 with a production of 502 cases). The entire range of winemaking art was employed here: whole cluster and whole berry pressing with primary and malolactic fermentation in French barriques and puncheons. A quarter of the barrels were new, 50% were a year old and the remainder were neutral. This wine begins with an appealing gold hue. It has the aroma of ripe apricots, tangerines and honey (there was some botrytis among the grapes). JoieFarm’s own notes speak of ripe Anjou pear, hazelnut skins and freshcut pineapple. That should tell you something about how complex the wine is. On the palate, there are rich but tangy flavours of citrus, pineapple and honey. There is so much going on that it is like drinking marmalade. This wine has plenty of heft, with the structure to age like a good Burgundy. 90. 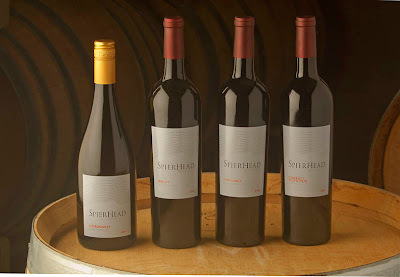 The big red is the 2008 PTG ($29.90 with a production of 780 cases). PTG stands for Passetoutgrain, which is what Burgundians call wines made from blends of Pinot Noir and Gamay. This wine is 60% Pinot Noir, 40% Gamay, with fruit from four vineyards on the Naramata Bench one in Vernon. Once again, all the stops were pulled out in making this wine, starting with the use of a sorting table to select the best berries. Some of the fruit was fermented in small tanks; some was fermented in a French oak cask and was actually trod by foot. You would be surprised how many Okanagan winemakers use bare feet to press Pinot Noir. The foot is much gentler than mechanical methods and gentle is good with Pinot Noir and Gamay. The wine is dark ruby with aromas of spicy cherries. On the palate, there are flavours of cherries and spice and cola. This is another wine with heft – a rich texture and a long finish. 90. These are interesting wines, made for food – after all, Michael and Heidi came to wine from careers in the restaurant business and Heidi is trained as a chef. The wines also have the structure to age. The winery suggests both will improve for another five to seven years. As if there will be any left! Lillooet is a long way from earning its own appellation but wine grapes have been growing here in a modest way for half a century – and now it is getting serious. I checked it out for myself recently, saw three vineyards and met interesting people. What else does a wine region need? The vineyard that started the current flurry of interest is at Roshard Acres, a farm just east of town perched on a plateau with the Fraser River rushing by 200 meters below. The farm is owned by Christ’l Roshard, a former mayor of Lillooet, and her partner Doug Robson. There is a small block of hybrid vines, primarily Maréchal Foch, which was established here in 1972 by Christ’l’s father, Robert, who died in 2008. In the 1960s, he managed Riverland Irrigated Farm for B.C. Electric Company. 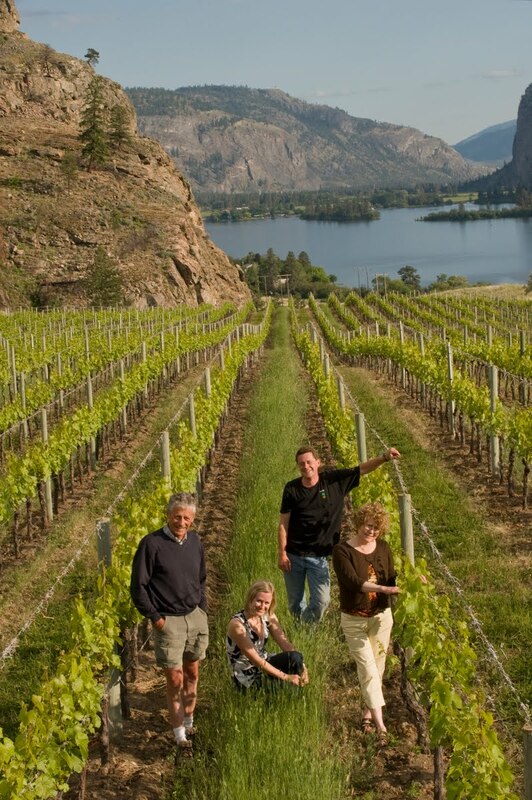 Wanting to see how wine grapes would do at Lillooet, the farm planted the varieties then commercially important in the Okanagan. After B.C. Hydro took over B.C. Electric, the farm was sold. 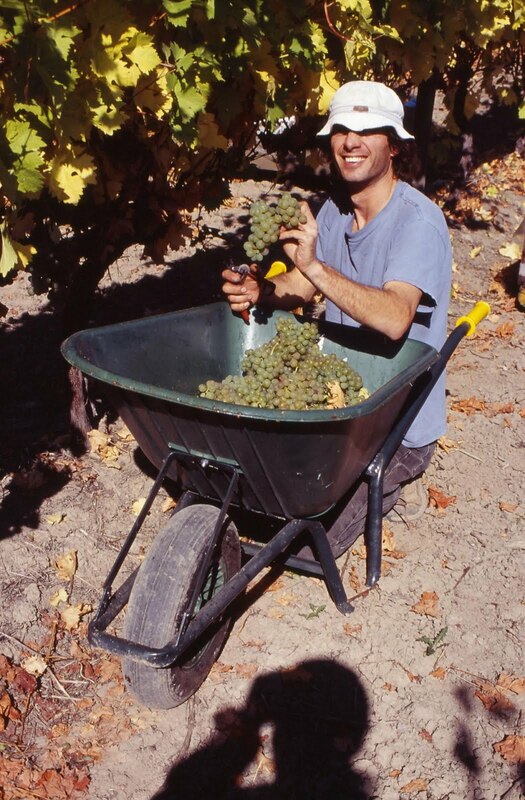 The vineyard trial was abandoned but Robert salvaged vines for a little home winemaking at his own property. Doug and Christ’l continue to make wines but they have no intention ever of opening a winery. The Maréchal Foch in particular still produces well and, to Doug’s credit, yields good wine. In 2004 a small group of farmers led by Christ’l decided to re-examine the future of wine grapes at Lillooet, in part to replace the jobs lost to a declining forest industry and a total collapse of ginseng production. 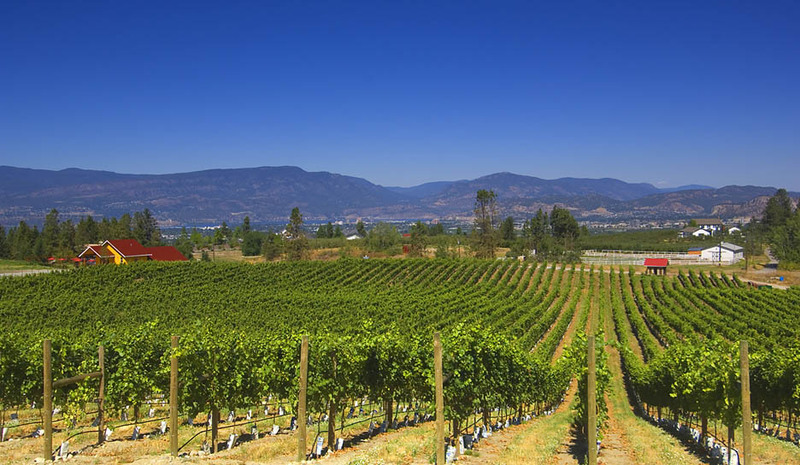 They secured vine cuttings of 20 vinifera varieties from the Okanagan and, with some funding from the province, planted test blocks in 2005 and 2006 on three farms, including Roshard Acres. The funding, which might run out next year, has paid for the deployment of 87 weather data collectors, the logging of the information, the analysis of grape ripeness and other information that future wine growers will need. The cold winter of 2008/2009 (it got down to -24.6ºC on December 20, 2008) caused measurable damage to the young plants. However, that needs to be kept in perspective: the same freeze hit the Okanagan and the Similkameen and triggered $20 million in crop insurance claims. Those vineyards have not been abandoned; nor have the Lillooet trial blocks even if some of the vines seem to be struggling. Independently of the Lillooet trial, two Whistler residents planted 20 or so varieties in 2009 on a 10-acre test block at a property called Texas Creek Ranch, a one-time orchard that now grows hay. The owners are Eckhard Zeidler, a former investment banker and now a Whistler councilor, and Brad Kasselman, who runs Whistler’s biggest photography company. At the Fort Berens Estate Winery at the edge of town, Heleen Pannekoek and Rolf De Bruin are betting the farm, so to speak, on Lillooet viticulture. In 2009 they planted 20 acres of vines (Riesling, Chardonnay, Pinot Gris, Pinot Noir, Merlot and Cabernet Franc). The vines are luxuriant, looking established enough to get through a normal winter and produce the winery’s first crop next year. They are career-changing immigrants from Holland, a professional couple (he was born in 1970) with two children. They met at the University of Groningen where both studied economics and business. Heleen worked 15 years at the ING Bank and Rolf, after being a financial controller with a telecom firm, switched to management consulting. They are getting advice from some of the best brains in the Okanagan: Sumac Ridge founder Harry McWatters, veteran vineyard manager Richard Cleave and form CedarCreek winemaker Tom DiBello. Earlier this year, they also brought in three partners with capital. These resources will be used to complete the vineyard and to build a new winery next year with the capacity to produce 4,000 cases. The winery will command a spectacular view over the Fraser River as it cuts through Lullooet. For now, they make the wine and operate a tasting room in a renovated tractor barn on land where the Hudson’s Bay Co. once planned (but did not build) a post called Fort Berens. Chardonnay 2009 ($18): In style, this will appeal to lovers of California Chardonnay with its buttery textures and its flavours of tangerine and peach nicely framed by oak. 86. Meritage 2007 ($28): This wine got a silver medal at this spring’s All Canadian Wine Competition, a nice credit for a debut offering. 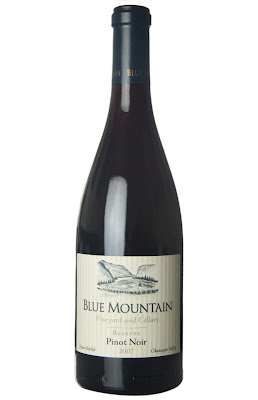 It has soft ripe tannins with plum and berry flavours. It is 80% Merlot, 15% Cabernet Sauvignon and 5% Cabernet Franc. 87. Meritage 2008 (likely $28 on release): Youthful and still firm, this has excellent flavours plum and black cherry and a structure to age well for another five years. 88. Cabernet Franc 2008 ($N.A.) 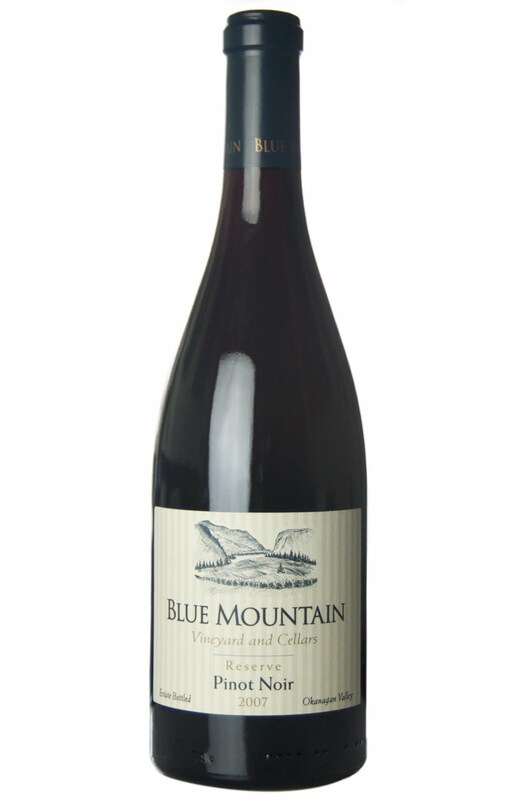 This wine has the classic spicy, brambly fruit that makes this variety appealing and, arguably, more reliable in B.C. vineyards than Cabernet Sauvignon. This wine is generous on the palate and again has the structure to age. 88. Late Harvest Riesling 2009 ($20). This wine was virtue from necessity when super-ripe grapes arrived at the winery. Rather than make a dry and alcoholic white, Rolf and Heleen have left residual sugar here. Not overly sweet, the wine tastes lightly of honey and apricots. 86. It is a good start for Lillooet’s first winery.